After spending over 30 years as a deputy sheriff and school resource officer, Jim Potter is enjoying his new life in retirement by expanding his writing career. His first book, Cop in the Classroom: Lessons I’ve Learned, Tales I’ve Told, has an abundance of police stories from his career in law enforcement and education. He’s also an award-winning writer for his play, Under the Radar: Race at School. However, once he completed his first novel, Taking Back the Bullet, he knew that he needed a promotional venue for not only the new novel, but all of his books, past and future, as well as a blog for sharing his insights about writing and life in general. 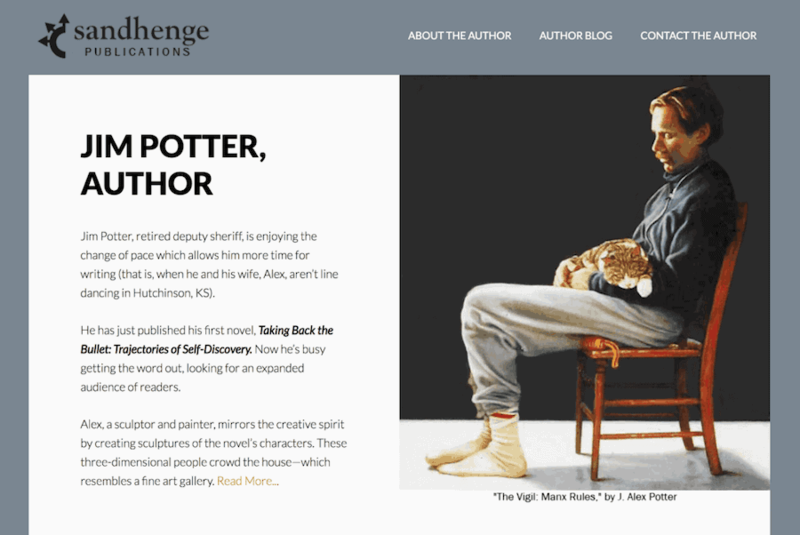 As we began to plan his new website, Jim and I spent some fun times together on his rural property near Medora, Kansas, where artwork created by his sculptor and painter wife, J. Alex Potter, transforms their home into an art gallery. It was an inspiring setting for our creative juices to flow as we brainstormed and laughed throughout the website planning process. In addition to photographing many of the paintings and sculptures to include, Jim had collected features that he liked from other author sites. I knew that this new website should reflect his unique spirit. I hope that the online “home” we have created is a magical dwelling place for the fascinating characters in Jim’s books, especially the three-dimensional people of his novel who crowd a house which resembles a fine art gallery. These include police officer Tom Jennings–“a mutant Idaho potato in a jiggling Jell-O suit;” James Odessa-Smith, with his schizoaffective disorder; and young Suanna Morningcloud, half Nez Perce Indian, half white, and all albino; all searching for their identities and culture, asking themselves: “Who am I and where do I belong?” In addition, we can experience the depth of the characters through the work of Alex Potter, whose sculptures add creativity and enlightenment to the web pages. Please visit Jim Potter’s website and sign up to receive his insightful and entertaining blog posts. Investigate the site, read about his books, and bask in the creative aura that emanates from Jim and Alex Potter.